Vote forFraser Island, QLDTop Island Destinations Which are Australia's must-visit destinations? You help us decide. Renowned for its blend of wondrous natural features that have helped contribute to its status as a World Heritage-protected national icon, Queensland's Fraser Island has enough unique characteristics to help separate itself from the many other Australian islands. While its sheer size is an obvious calling card - it's the world's largest sand island, after all – Fraser is not merely your standard forest-covered clump of sand. Mangrove forest, over 40 crystal-clear freshwater lakes, rolling dunes and more all form part of Fraser Island's glorious makeup. Fraser Island's vast expanse offers a number of natural attractions that make for wonderful explorative opportunities, and this environmental diversity is all easily reachable from the nearby hub of Hervey Bay on the QLD mainland. Island-style scenery is all here at its finest, and sections that delve into the heart of ancient subtropical rainforest break up the typical blue-and-gold coastal portions with thick and lush dashes of greenery – much of which can be explored on foot. The coast of the island is picturesque and the beaches exceedingly wide, while there are numerous chances for some beautiful swimming in the variety of lakes on offer. Fraser's lakes are headlined by the spectacular Lake McKenzie which many visitors often cite as one of the main highlights. Lake McKenzie has a water colour that ranges from crystal-clear in the shallows to a vivid azure blue in the deeper areas, and as it is completely sheltered, it's the closest equivalent to an isolated natural “pool” as the natural world can offer. Fraser Island's vast sand dunes are another hallmark and their sheer size and scale is impressive. Those willing to put some leg power in can ascend to the top of the blows and garner some inspiring views of the surrounding panorama. Sand also constitutes Fraser Island's main transport thoroughfare, with a veritable 'sand highway' that spans nearly 120km in length and can be surprisingly busy with 4WD vehicles (both private and tour operators) making their way from north to south. The island is also a hotspot for wildlife, and is home to a wide range of different species that visitors can encounter on their journeys. While perhaps the most iconic of these is the Australian dingo, there are plenty of other opportunities for animal spotting – wallabies, echidnas, possums over 230 kinds of birds can be found on the island proper, while in the surrounding waters sea turtles, humpback whales (during their annual migration period) and even dugongs can be found plying their trade. Throw in a dash of history with its smattering of shipwrecks, and Fraser Island offers a landscape with a level of variety that few other islands in Australia can match. With its visitor-friendly nature and a consistent level of conservation keeping it in tip-top shape, Fraser Island is an essential visit for anyone travelling the Australian east coast. Looking to pay a visit to Fraser Island but not sure what to do? Here are some of its most essential experiences. What's new on Fraser Island? Adrenaline junkies now have the opportunity to skydive above Fraser Island and cap it off with a guaranteed landing with Skydive Australia's new local jump offering. Fraser Island and its surrounding Fraser Coast region continue to be a major whale watching hotspot in Australia, seeing record whale numbers once again this year. 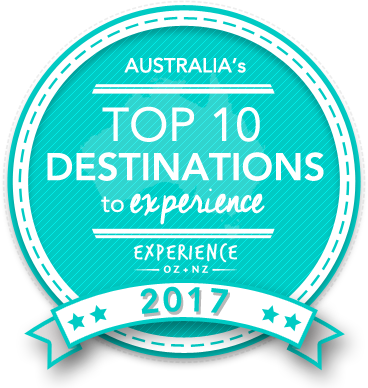 Is Fraser Island Australia's Top Island Destination to Experience for 2017? Vote now for the chance to WIN an epic trip to one of Australia's top destinations!